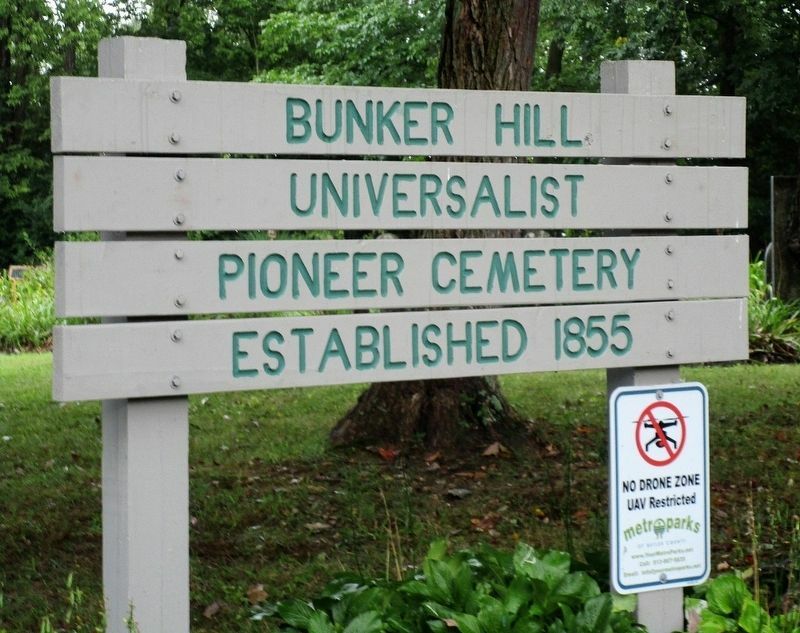 The Bunker Hill Society was organized about 1845 and fellowshipped in 1854. A frame meeting house, capable of seating 300, was dedicated in 1855. Thirty people united with the church during the 1859 Annual Meeting. The membership suffered greatly during the Civil War, many enlisting in the Union Army. Some members, Like John G. Agnew, were Peace Democrats (Copperheads). Agnew withdrew from the church on July 5, 1863 saying, "I feel the course I am and have been pursuing does not comport with the Christian character. Nor do I think that I can be better while this war lasts. I do not wish to be a reproach upon the church." The church was re-fellowshipped in 1900. The last sermon was delivered October 23, 1910. Fire destroyed the building May 8, 1924.
with the Welliver burial ground. The vacant land around the Deneen Cemetery was purchased for additional burial plots. The last burial was in 1918. There are numerous unmarked graves. Veterans of the Revolutionary War, War of 1812, Mexican War and Civil War rest here. Four sons from the Bressler family fought in the Civil War. John M., who died for the Union cause, and Jonathan, a Confederate (Alabama) artillery officer are buried here. 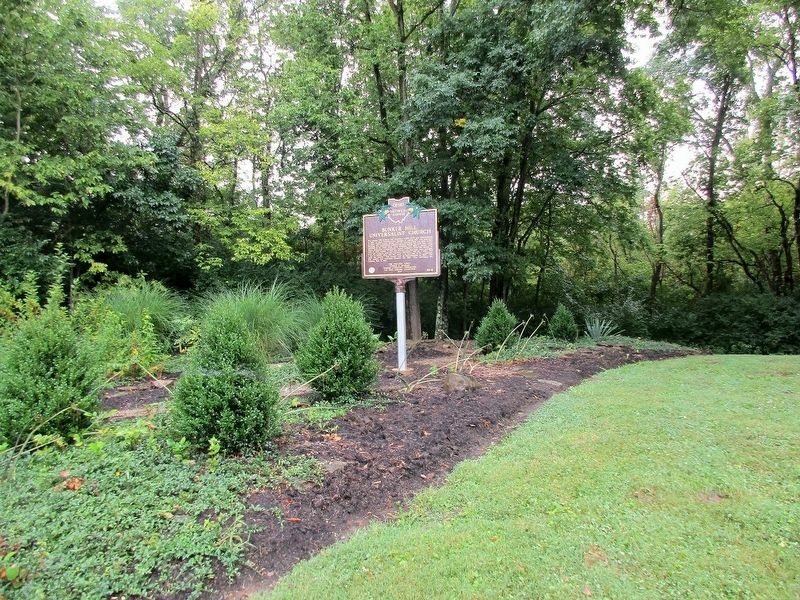 The site became a county historical park in 1964. Location. 39° 25.226′ N, 84° 43.907′ W. Marker is near Oxford, Ohio, in Butler County. 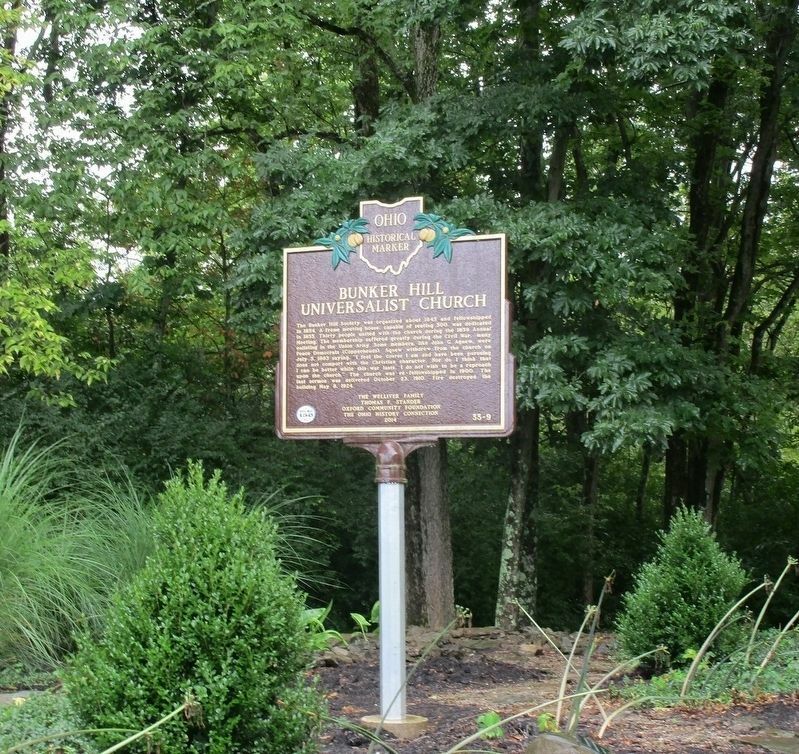 Marker is on Reily-Millville Road (County Route 29) 0.2 miles west of Bunker Hill Woods Road, on the right when traveling east. Touch for map. 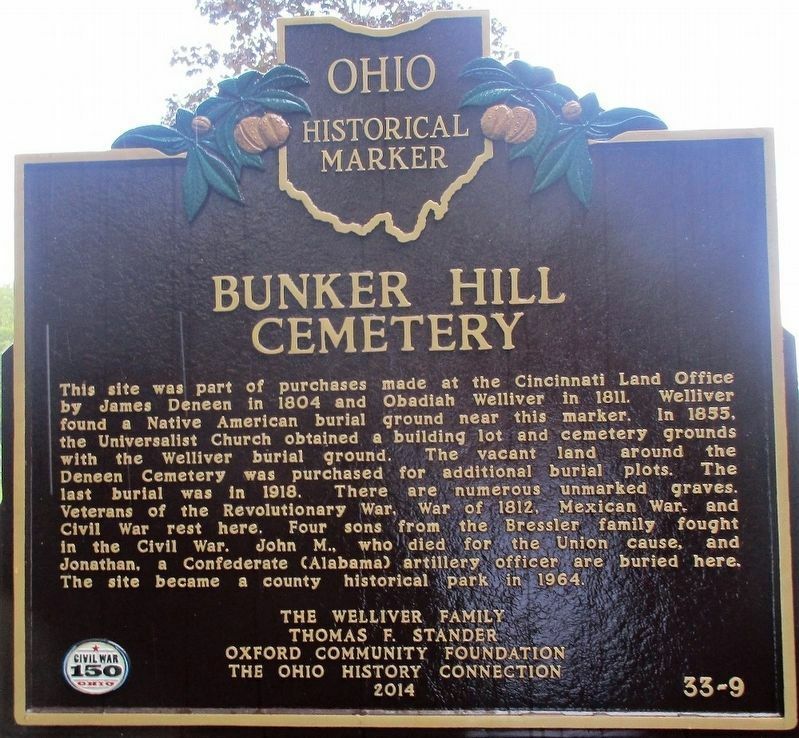 Marker is in Bunker Hill Cemetery, in the Pater Wildlife Area. Marker is at or near this postal address: 5359 Reily-Millville Road, Oxford OH 45056, United States of America. Touch for directions. Other nearby markers. At least 8 other markers are within 6 miles of this marker, measured as the crow flies. Bunker Hill / Dog Town (approx. 0.4 miles away); Bethel Chapel (approx. 2.4 miles away); Bethel Chapel 1815- 1873 (approx. 2½ miles away); Stillwell Cemetery Veterans Memorial (approx. 3½ miles away); Stillwell’s Corners (approx. 3½ miles away); Indian Creek Baptist Church (approx. 4.2 miles away); Birthplace of William Bebb (approx. 5.2 miles away); 1858 Morgan Township House / Copperheadism in Butler County (approx. 5.3 miles away). Touch for a list and map of all markers in Oxford. More. 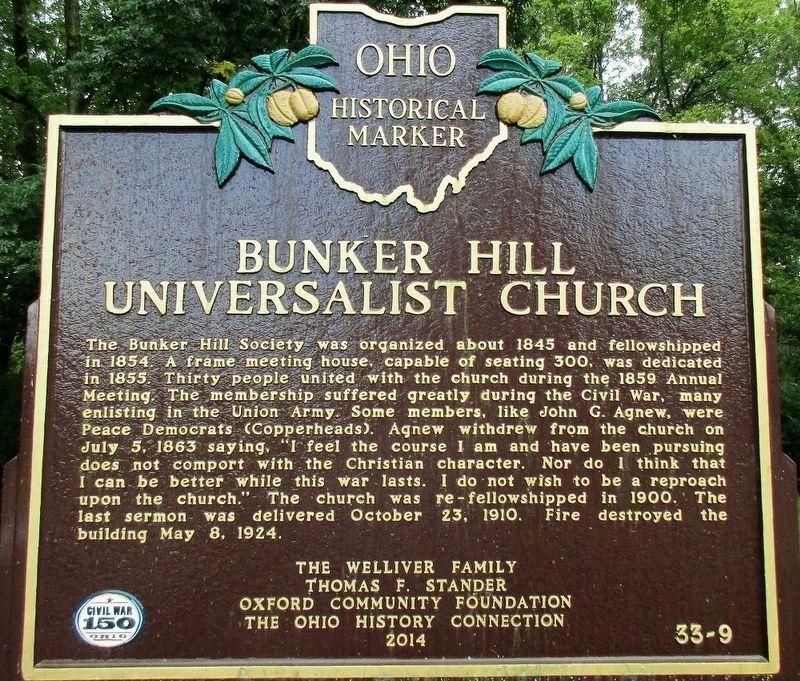 Search the internet for Bunker Hill Universalist Church/Bunker Hill Cemetery. Credits. This page was last revised on September 1, 2017. This page originally submitted on August 31, 2017, by Rev. Ronald Irick of West Liberty, Ohio. This page has been viewed 99 times since then and 5 times this year. Photos: 1, 2, 3, 4, 5. submitted on August 31, 2017, by Rev. Ronald Irick of West Liberty, Ohio. • Bernard Fisher was the editor who published this page.